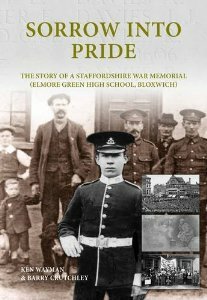 Elmore Green High School in Bloxwich, Staffordshire, saw many of its pupils march off to the war between 1914 and 1918. Sixty Seven of them did not return and are commemorated on a war memorial erected in the school in 1922. Like many of the ‘war memorial’ books that I have reviewed, Sorrow Into Pride is likely to appeal mainly to the residents of the Bloxwich areas and families of the men named on the memorial. Yet for anyone else the book is still an interesting read, a story of a memorial lost and found again, of dedicated research, and an account of how the war affected a community within a community. Split into three parts, the book firstly looks at pre-war Bloxwich, in particular looking at the school itself and the role of the colliery in the community, drawing on many contemporary resources. Part two moves on to examine the outbreak of war and each of the key players. It also looks at the composition of the British Armed Forces in 1914 and the mobilisation of and recruitment to the Army in summer 1914. The bulk of the book is dedicated to Part three, looking in turn at each of the names commemorated on the memorial. These are presented chronologically against a month by month account of the war. At the end of each year an alphabetical roll of honour is provided which provides more biographical information about each casualty. The information is detailed, covering personal life, military service, unit history, death, commemoration, medal entitlement, and family. Final chapters provide details of the rededication ceremony for the memorial, the full roll of honour, and a look at the post-war Bloxwich to which the returning soldiers came home to. Comprehensive appendices cover topics such as how to research a serviceman, and a list of the cemeteries and memorials that the local men are buried in and commemorated on. The book is comprehensively illustrated not only with pictures of the casualties, but photos relevant to the local area as well as general pictures related to the narrative about the course of the war and basic maps. Sorrow Into Pride is a work of pride itself. It is obvious that a huge amount of time and commitment has been put into the work, and for those who may be reading this as their first foray into the First World War, it not only gives them a detailed account of the effect of the war on this one school, but also the wider community and the course of the war itself.